For some, camping in an RV just isn't camping. If you want cable TV, wireless Internet and all the modern comforts, you can find plenty of campgrounds that have them, but the Buckeye State also has its fair share of secluded tent campgrounds. From the Lake Erie shoreline to the hills of southern Ohio, numerous opportunities are available for campers who need little more than a quiet place to pitch their tent. About 300 miles of Lake Erie shoreline make up Ohio's northern border, and you'll find a lot of places to camp along its length. One of the best is Kelleys Island State Park, which provides more than 100 campsites, including 45 non-electric tent sites. This 677-acre park sits on a secluded island north of Sandusky, and includes swimming, boat ramps and fishing access. The campgrounds include most of the amenities typical of an Ohio State Park, including drinking water, campfire rings, picnic tables, modern restrooms and showers. Nearby South Bass Island State Park has 120 primitive campsites, and Geneva State Park has a few primitive tent sites along with a large electric campground that is open to both tents and RVs. Reservations are available by phone or through the Ohio State Parks website. Northwest Ohio is a flat, mostly rural landscape dotted with lakes and reservoirs. Several of these lakes are accessible through state parks, and Lake Loramie State Park is a particularly enticing destination for tent campers. Most of the park's 175 campsites are electric, and they fill up quickly with RVs during the summer months, but a small, private tent campground is set aside on a lakeside peninsula. Right on the water, the tent sites are close enough to the main campground for easy access to the restroom and shower facilities. Boating, hiking trails, picnic areas, fishing access and swimming access are available. Additional tent camping opportunities in the region include Kiser Lake State Park, which overlooks the lake of the same name, and Wolf Creek County Park, along the Sandusky River. The Dayton and Cincinnati area of southwest Ohio is home to the Five Rivers MetroParks system, which includes more than a dozen parks. Seven of these offer camping, and the Germantown and Twin Creek MetroParks are of particular interest to tent campers. These two parks -- both about 20 minutes west of Dayton -- are linked by the 43-mile Twin Valley Trail. In addition to tent campgrounds in both parks, numerous backcountry campsites are scattered along the trail, providing a place for backpackers to pitch a tent overnight. The accommodations are more primitive than most state parks. Restrooms and drinking water are available in some areas, but most backcountry sites lack even these basic amenities. Camping is free, but you must obtain a camping permit a week in advance. Reservation and permit information is available on the Five Rivers MetroParks website. The Hocking Hills region of southeast Ohio is one of the most wild and scenic areas in the state. Known for dense forests, winding streams, rugged hiking trails and glistening lakes, this area also includes dozens of campgrounds. Tent enthusiasts have a lot of options. Hocking Hills State Park offers a small primitive campground separate from the main electric campground, and nearby Lake Hope State Park has more than 140 non-electric sites as well as a primitive group camping area. 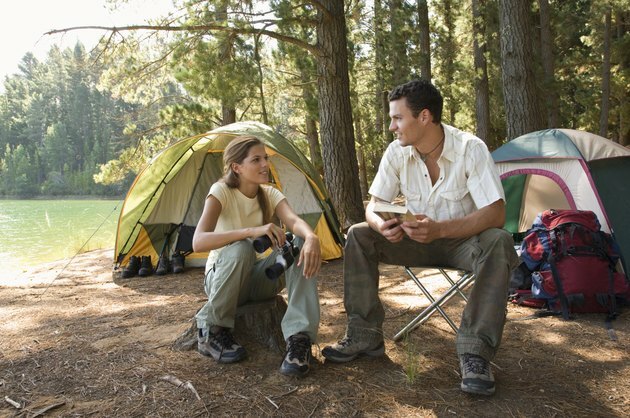 You can also explore a wide range of camping options within Wayne National Forest. Primitive campgrounds in the forest, such as the Burr Oak Cove Campground, provide both drive-in and hike-in tent sites with limited amenities. Backcountry tent camping is also permitted throughout most of the national forest. Further details are available through the USDA Forest Service website. Ohio Campers: Come Camping in Ohio!